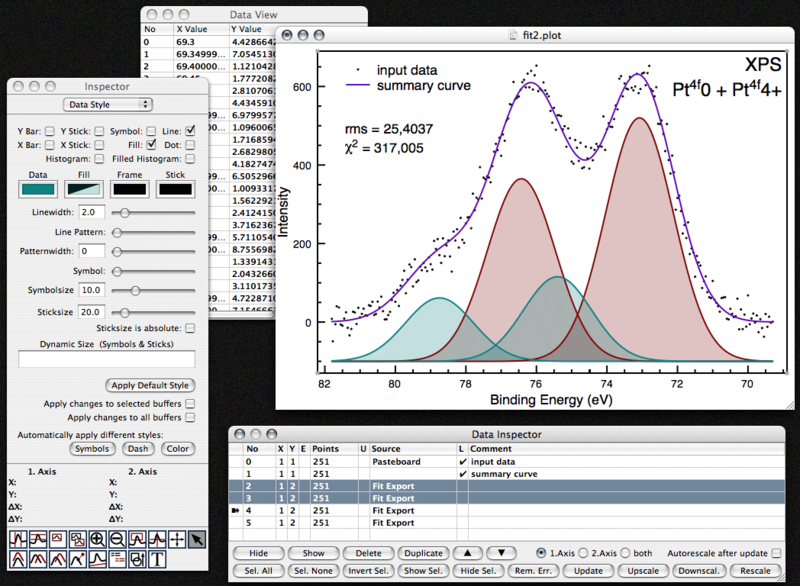 Plot is a scientific 2D plotting program for Mac OS X. Plot is a completely rewritten descendant of SciPlot which was a plotting program for NeXTStep. Basically Plot allows to work with multiple documents where every document consists of one or more XY data sets (called buffer in Plot). Unlike some other programs each XY data buffer is independent (without are shared X axis or so). In addition it is also possible to save individual X and Y error values for each data point. Plot supports many plotting styles like lines, symbols, grids, bars, filled areas, sticks, dots, histograms, errorbars, automatic legend, text and graphic objects, etc. Plot has many data manipulation methods integrated: curve fitting, spline fit, fft smooth, least square smooth, spline interpolation, differentiation, integration, FFT, least square regression, normalizing, moving, data calculations, function generator, etc. The data buffers are managed by the Data Inspector. To make plotting easy many attributes (e.g. axis ranges, axis labels) will be generated automatically but it is possible to change most graphic attribute by hand. The main tool in Plot is the Inspector which controls all attributes of your document, show measured values and allow the mouse mode selection. The Inspector also controls the graphic attributes of the data buffers. There is also a tool called Data View which allows direct manipulation of data points in a spreadsheet like table. Plot has also a builtin programming interface which allow editing of Plot macros, Perl import filters and Perl data filter. The macro language has ~ 220 builtin commands and allow to automate complex tasks. Last not least there is a Calculator for instant calculations. Of course there are also several menu items which allow many operations.